Peak load electricity, base load electricity. Electricity can only be stored to a limited extent and at relatively high costs. Therefore, primary production, i.e. not from storage, is typically closely linked to demand. Furthermore there is a large variation between countries in what constitutes the temporal electricity mix. Since demand for electricity varies over the day, some electricity plants are specifically used to accommodate the peak load demand (peak plants, that can easily regulate output, but usually at a higher cost per produced unit), while other plants (base load plants, that are more efficient but less flexible in their output), accommodate the base load demand (the demand that is the same during all 24 hours). Sometimes the term “intermediate load” (or load following) is also used (to distinguish power plants that are intermediate in efficiency, cost and startup). However, in the context of LCA modelling, intermediate and peak load can be viewed as one as they are both separate from the base load. A specific demand for electricity can be identified as base load or peak load demand depending on whether the demand is constant over all 24 hours or cannot be determined to occur at any specific time (base load demand) or whether it occurs at a specific time of day. It is not so important to determine the specific timing of the demand, as whether the demand is constant or variable over the 24 hour period. The base load market and the peak load market is therefore not so much distinguished by a specific time of day as by the minimum requirement at night time, where the demand is lowest. 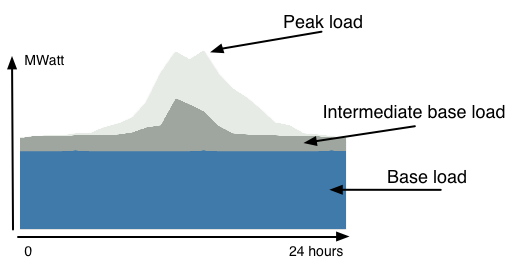 The production volume of the base load market (see figure below) is therefore equivalent to the minimum output in W over 24 hours multiplied by 24 hours, while the peak load market has the remaining out of the total electricity production volume. Figure: Schematic representation of the principle of peak load (incl. intermediate load) and variable and constant base load. More information may be found on the International Energy Agency. To go beyond the general principles presented here specific temporal distribution data from the studied country are needed.